His most recent attack on a women’s right to choose came on Dec. 22 when Kasich signed HB 214, a bill that will prohibit women from seeking an abortion following a diagnosis of Down syndrome. However, that’s not where the bill stops. This new law will also thump physicians with felony criminal charges if they perform the procedure following the diagnosis. “A hand steady on the wheel” is what Kasich and Ohio’s Republican-controlled State House and Senate have held with their continuous attack on the reproductive rights of women. But it seems they’re driving on a road to nowhere since a majority of Ohio is in favor of keeping abortion legal in all or most cases. Gov. Kasich has been restricting the reproductive rights of women constatntly since taking office in 2011. These bans are not where Ohio lawmakers draw the line when meddling in women’s health. They also steadily feed more state funds into crisis pregnancy centers that are shown to intimidate and misinform on the choices women have when facing pregnancy. Instead of fighting this fraud, Kasich and crew have decided to drain Planned Parenthood in Ohio of state funds they receive for their many services. Kasich and his team of conservatives in the Ohio House and Senate are consistently going against the will of their constituents when creating and signing these harmful bills. This recent action by Kasich is his 20th attack on reproductive health access since taking office in 2011. Kasich has spent seven years fixated on dictating what women can do with their bodies and when those choices can be made. This recent action certainly won’t be his last. There are currently two other abortion bans pending; one being the six-week ban and the other being “the method ban” that would make accessing abortion as early as 13 weeks into pregnancy illegal. 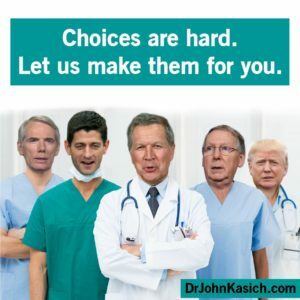 This is one of the many amazing images from Dr. John Kasich, Gynotician.